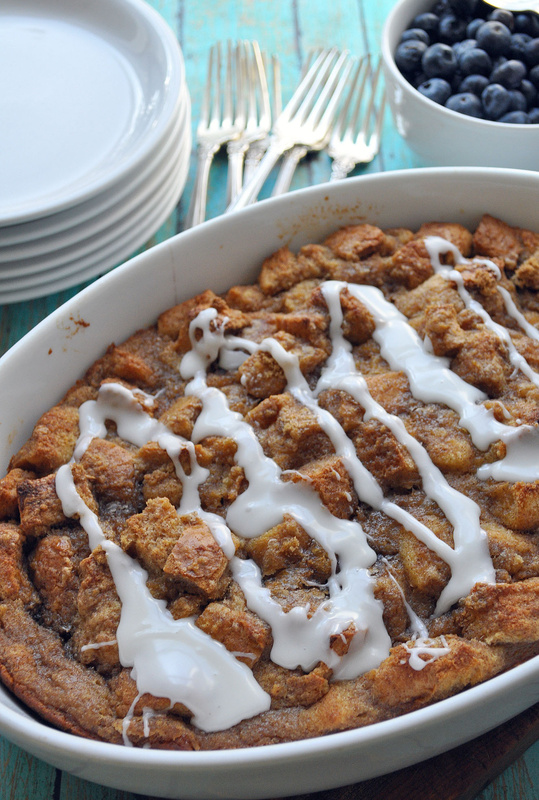 Apple cinnamon bread pudding, created by Heather Scholten, makes an easy, delicious addition to an Easter brunch. Scholten develops recipes for her Farmgirl Gourmet blog, www.farmgirlgourmet.com. Putting on a beautiful brunch shouldn’t require a team of sous chefs. They wouldn’t fit in your kitchen anyway. With some planning and a few advance preparations, brunch comes together quickly with dishes that are mostly hands-off or can be prepared the day before. On Easter Sunday, that means casseroles or quiches can be popped into the oven after church services. While the dishes are baking, prepare fruit, steam or sauté asparagus, set out any baked goods and pour coffee and mimosas for an elegant meal. We turned to local chefs and recipe developers for ideas on what to serve. They shared recipes, both savory and sweet, that come together quickly or can be reheated easily. Heather Scholten, aka Farmgirl Gourmet, spiced up bread cubes with cinnamon and applesauce for a warm bread pudding (recipe follows). There are more photos of the process on her blog at www.farmgirlgourmet .com. For those who are ready for more of a challenge, Scholten also posted the recipe recently for a goat cheese quiche with a sweet potato crust that looks divine. It would be a nice gluten-free main dish offering. The preparation will take longer than the bread pudding, but she still promises it is relatively easy. At Europa Restaurant and Bakery, chef Jeff Engels will prepare an English muffin-based savory bread pudding (recipe follows) that will serve as the edible platform for the eggs Benedict on the restaurant’s Easter brunch menu. Engels will top each piece of the bread pudding with a poached egg, ham and hollandaise. Ambitious cooks can do the same at home, or just add herbs and vegetables such as zucchini, mushrooms and roasted red peppers to the basic recipe for a heartier casserole. Top each piece with sausage gravy or hollandaise, if desired. Chef Katie Freeman, of Remington’s at the Ramada, shared an easy and comforting au gratin potatoes recipe that often makes an appearance (with a slight tweak or two) on the brunch buffet. She added blue cheese to the casserole for a twist that would work as well alongside Easter dinner ham as it does on the brunch table. Savory and sweet flavors are married in a quiche featuring apples, raisins and cheddar cheese from Timothy Grayson, executive chef at Whitworth University. The quiche is quick to mix up and bakes in a prepared crust. He suggests serving it with smoked or maple bacon. Because easy is the theme for your brunch, don’t stand over the spattering bacon at the stove top. While the quiche cools, crank the oven to 425 degrees. Spread uncooked bacon slices out on a cooling rack set inside a rimmed baking sheet. That allows the fat to drip away from the bacon as it cooks. Cook 10 to 15 minutes or until crisp. Heather Scholten, Farmgirl Gourmet, www.farmgirlgourmet.com. Scholten, who develops recipes for her blog and businesses including local manufacturer Zak Designs, admitted, “It is fantastic and I may have eaten a large slab of it for breakfast – so much for reducing my carb intake.” There are more photos of the recipe and the cooking process on the Farmgirl Gourmet blog. Preheat oven to 350 degrees. Spray a 9-by-13-inch baking dish with cooking spray. Set aside. In a large bowl, add the applesauce, eggs, brown sugar, white sugar, milk and cinnamon. Whisk to combine. Add the bread cubes and toss lightly to coat. Allow to sit for a few minutes. Add to prepared baking dish and sprinkle the remaining 2 tablespoons of brown sugar over the top. Bake uncovered for 50-55 minutes, or until the center is set and the pudding has puffed. Remove from the oven and cool for a few minutes. Add powdered sugar, vanilla and milk to a small bowl and stir to combine. Drizzle over the warm bread pudding and serve immediately. From chef Katie Freeman, of Remington’s at the Ramada Spokane Airport. These au gratin potatoes, with a small twist of ingredients here and there, often can be found among the dishes in the buffet at Remington’s. Sauté onion with a healthy pinch of salt in butter over medium heat until onion is caramelized, approximately 6 to 8 minutes. Reserve. Butter a deep 9-by-13-inch baking dish, rub bottom of dish with garlic and sprinkle with thyme leaves. Layer in 1/3 of the potatoes, sprinkle with salt and freshly ground black pepper to taste. Top with 1/2 the onions, 1/3 of the white cheddar and 1/3 blue cheese crumbles. Repeat this to make a second layer. Top with the last 1/3 of the potatoes. Pour over cream and chicken broth. Finish with rest of cheese and sprinkle with paprika. Bake at 350 degrees for 45 minutes covered with foil. Remove foil and bake another 15 minutes or until potatoes are tender and top has browned. Let the potatoes rest for 15 minutes before serving. The potatoes can be prepared ahead of time and held in a warm oven, or reheated. From chef Jeff Engels, Europa Restaurant and Bakery. Engels, who co-owns Europa with his wife, Aja, will use the casserole as a base for the eggs Benedict on the Easter Brunch menu Sunday. He’ll top each piece with a poached egg, ham and hollandaise. To serve it as a brunch casserole, add zucchini, mushrooms, roasted peppers and fresh herbs, Engels said. Or, top with sausage gravy or hollandaise. Spray 13-by-9-inch glass pan and combine ingredients except for shredded cheese. Add ingredients to the pan, top with cheese and bake at 325 degrees for 45 minutes. The bread pudding can easily be made and refrigerated before baking. Top with poached eggs, ham and hollandaise, or sausage gravy before serving. From chef Timothy Grayson, executive chef at Whitworth University. This quiche comes together quickly with a prepared 9-inch pie crust. Grayson suggests serving it with a side of smoked or maple bacon. In a glass bowl, add raisins and water with optional brandy or rum and put in refrigerator to chill and reconstitute. Then, in a skillet, sauté apple slices in butter for 5 minutes over medium heat. Next, poke some holes in the pie crust with a fork and then layer the apples into the pie shell and sprinkle with brown sugar, allspice and cheddar cheese. In a bowl, whisk eggs and whipping cream until mixed well. Then remove raisins from refrigerator and drain well and add to egg mixture and then pour over apple mixture in pie shell. Bake at 375 degrees for 35 minutes or until set. Serve warm. Garnish with additional whipped cream and sprinkle of nutmeg or cinnamon, if desired.